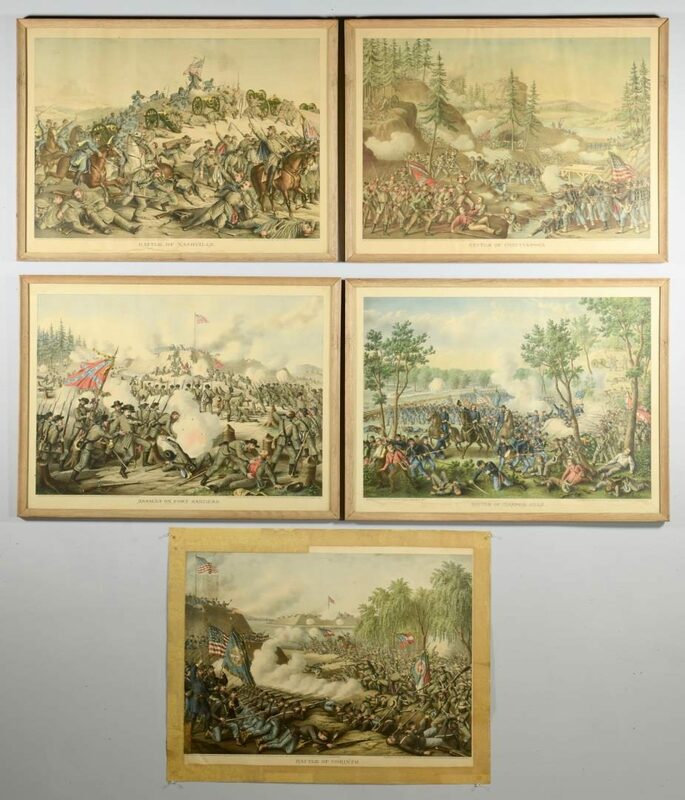 Set of Five (5) Civil War Chromolithographs, Kurz & Allison, 1887-1891. 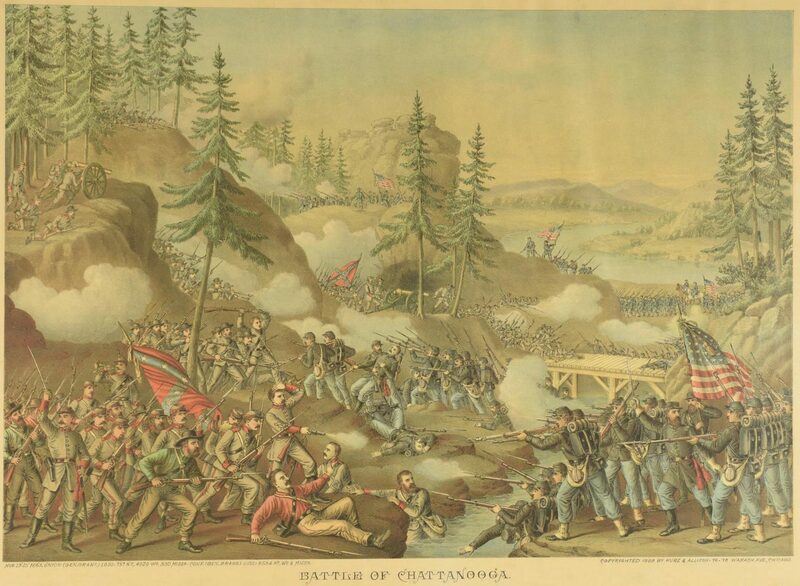 1st item: Battle of Chattanooga chromolithograph, 1888. "NOV. 23'-25' 1863. UNION-(GEN.GRANT.) LOSS: 757 KO, 4529 WO, 330 MISSO-CONF. (GEN. BRAGG.) LOSS: 8684 KO, WO & MISSO. ", left below image, "COPYRIGHTED 1888 BY KURZ & ALLISON – 76 – 78 WABASH AVE., CHICAGO." right below image. Housed in wooden frame. 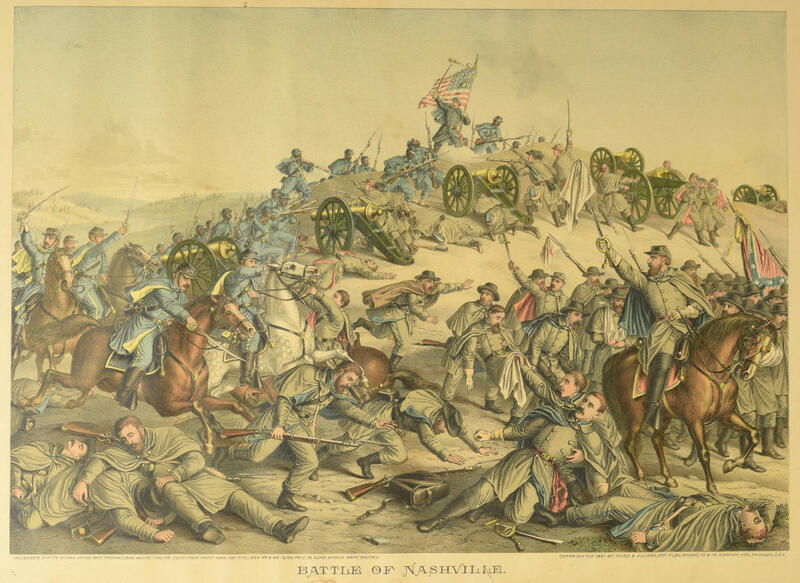 Image – 17 1/2" H x 25" W. Framed – 21 1/4" H x 28 1/4" W. 2nd item: Battle of Nashville chromolithograph, 1891. "DECEMBER 15' 16 '17' & 18' 1864. UNION (GEN. THOMAS) LOSS: 400 KO, 1740 WD. CONF. (GEN. HOOD) LOSS: 287 OFF., 1524 KO & WD 13, 189 PRIS., 72 GUNS. WHOLE ARMY ROUTED. ", left below image, "COPYRIGHTED 1891 BY KURZ & ALLISON, ART PUBLISHERS, 76 & 78 WABASH AVE., CHICAGO, U.S.A. Housed in wooden frame. 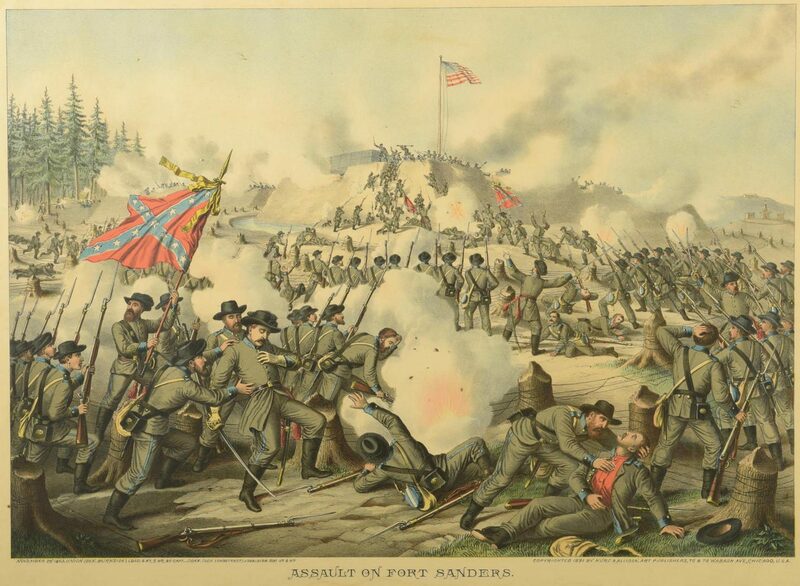 Image – 17 1/2" H x 25" W. Framed – 21 1/4" H x 28 1/4" W. 3rd item: Assault on Fort Sanders chromolithograph, 1891. "NOVEMBER 29' 1863. UNION (GEN. BURNSIDE) LOSS: 8 KO, 5 WD, 30 CAPT._CONF. (GEN LONGSTREET) LOSS: OVER 500 KO & WD", left below image, "COPYRIGHTED 1891 BY KURZ & ALLISON, ART PUBLISHERS, 76 & 78 WABASH AVE., CHICAGO, U.S.A.", right below image. Housed in wooden frame. 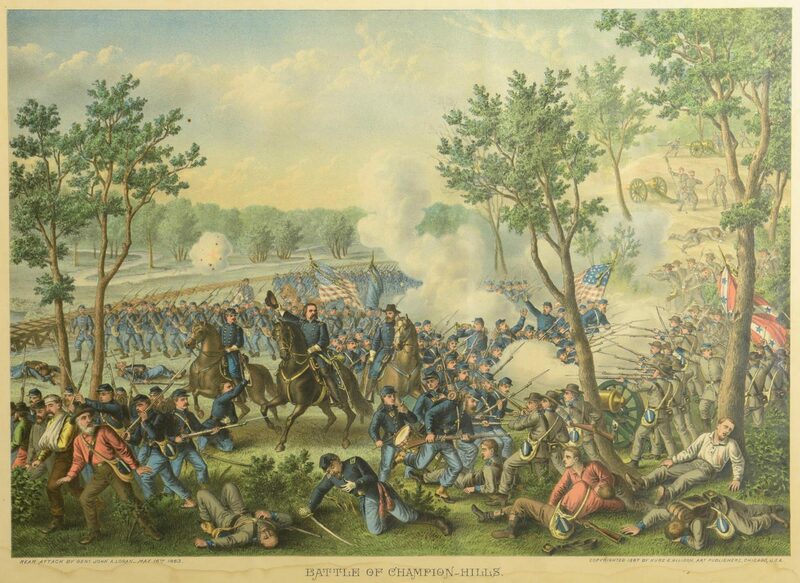 Image – 17 1/2" H x 25" W. Framed – 21 1/8" H x 28" W. 4th item: Battle of Champion-Hills chromolithograph, 1887. "REAR ATTACK BY GENL. JOHN A. LOGAN_MAY 16th 1863. ", left below image, "COPYRIGHTED 1887 BY KURZ & ALLISON, ART PUBLISHERS, CHICAGO, U.S.A.", right below image. Housed in wooden frame. 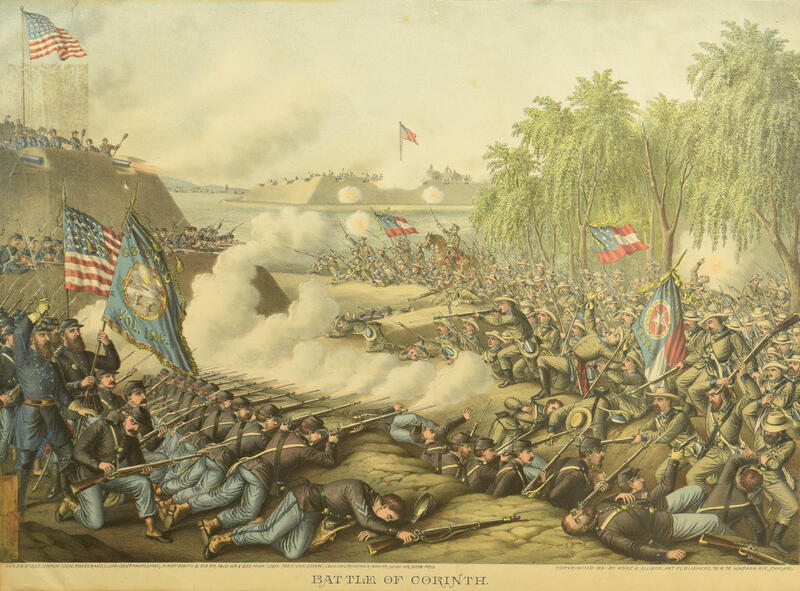 Image – 17 1/2" H x 25" W. Framed – 21 1/8" H x 28 1/4" W. 5th item: Battle of Cornith chromolithograph, Kurz & Allison, 1891. Depicts the Civil War Battle of Corinth, fought October 3-4, 1862, at Corinth, Mississippi, specifically the 63rd Ohio Volunteer Infantry, left foreground, and the 2nd Texas Legion, right foreground, as identified by their respective banners. Union and Confederate soldiers engage in combat, middle and background. "BATTLE OF CORINTH." centered below image, "OCT. 3' & 4' 1862. UNION (GEN. ROSENCRANS) LOSS: GENS HACKLEMAN, KIRBY SMITH & 315 KD, 1812 WD & 232 MISG. CONF. (GEN. VAN DORN) LOSS: COL. ROGERS & 1424 KD, 5000 WD, 2268 PRIS." left below image, "COPYRIGHTED 1891 BY KURZ & ALLISON, ART PUBLISHERS, 76 & 78 WABASH AVE., CHICAGO." right below image. Image – 17 1/2" H x 25" W. Overall – 22" H x 28 1/8" W. Provenance: Estate of James J. Allen, Knoxville, TN. CONDITION: 1st item: Paper wrinkled, toning. 2nd item: Water damage, bottom edge of paper, toning, 1/2" tear, bottom center of paper. 3rd item: Slight water damage, bottom edge of paper. 4th item: Water damage, bottom edge of paper. 5th item: Hole, 6 3/4" tear, and toning, top left of image. Pinprick holes, top right of image and above. Toning, top left of image. Damaged paper reinforced around edges by yellowing masking tape.